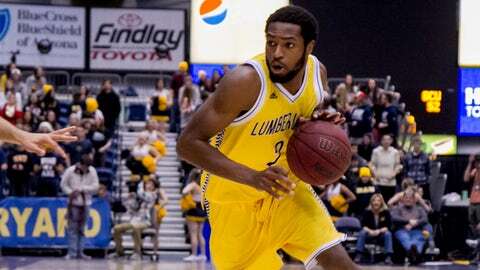 Quinton Upshur, a junior transfer, averaged 15.8 points and 1.6 steals for NAU this season. Northern Arizona junior guard Quinton Upshur was named the 2014 Big Sky newcomer of the year and earned a spot on the All-Big Sky first team in voting announced Monday. Senior forward Max Jacobsen received honorable-mention accolades. "It’s a blessing from the Lord," Upshur said of the recognition. "I want to thank my teammates and the coaching staff for putting me in a position to receive the award. If it wasn’t for my teammates setting screens, passing me the ball and the coaches setting plays for me, this wouldn’t have happened. I’m very grateful." Upshur, a 6-foot-5 transfer from Norfolk, Va., averaged 15.8 points and 1.6 steals per game. He is the first NAU player to win newcomer of the year since Tyrone Bazy in 2005-06. Upshur ranked seventh in the Big Sky in scoring and also was fourth in steals, seecond in 3-point field-goal percentage, third in 3-pointers made and ninth in blocked shots. He scored in double figures in all but two conference games and tallied 20 or more points six times in Big Sky play, including a career-high 32 points against Northern Colorado. Jacobsen ranked 22nd in the Big Sky in scoring in conference games. The rest of the All-Big Sky first team: Eastern Washington guard Tyler Harvey, Montana wing Kareem Jamar, North Dakota wing Troy Huff, Weber State wing Davion Berry and Sacramento State guard Mikh McKinney.